We refactored notification webhooks this week. Webhook subscribers will receive a POST request containing a JSON payload for incident and planned maintenance status updates. Statusbot is a friendly bot who hangs around your IRC channel and posts status updates. IRC notifications are still in the experimental phase. If you try out this feature, we would appreciate any feedback. To set up IRC notifications, navigate on over to the Settings view in the Dashboard. Enter the channel name on the FreeNode network. The ‘#’ or ‘##’ must be included in the channel name. After successful configuration, Statusbot will join your channel. Last month we rolled out custom HTML, adding the ability to inject a custom header and footer on your status page. Today we’re announcing custom CSS functionality. Paste your CSS directly in the Dashboard Design view. We’re happy to announce our shiny new knowledge base today. 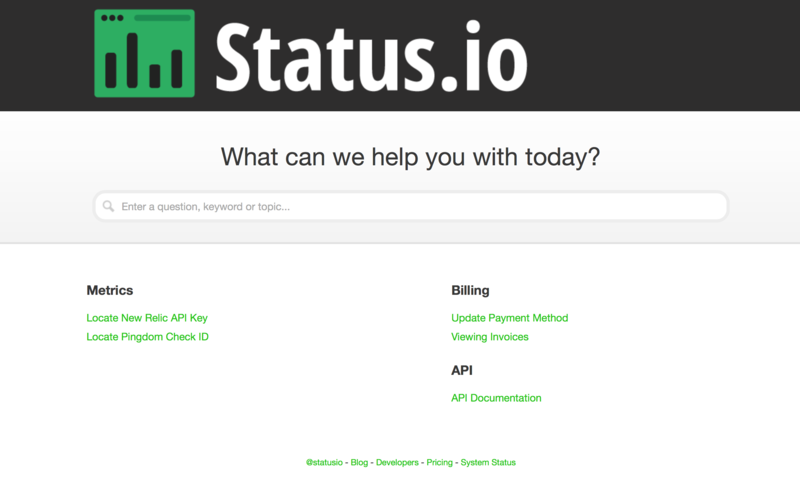 Visit kb.status.io for all of your Status.io documentation needs. Up until now we only offered the Response Time metrics with our Pingdom integration. We’re happy to announce that you may now set up your Pingdom metrics to display the uptime.